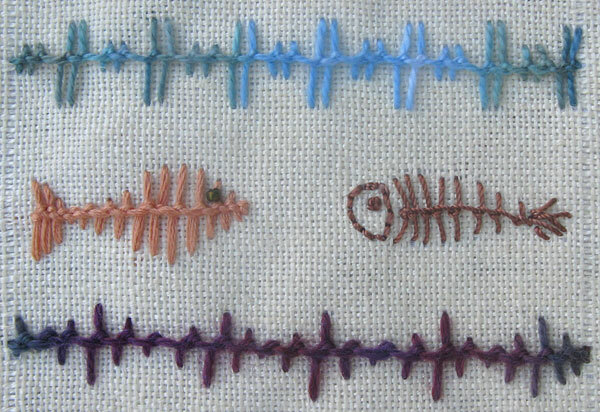 I am partisipating in TAST II That is Take A Stitch Tuesday round 2. I started with a size 5 cotton pearl thread. Then tried it with a size 5 Rayon pearl twist thread. Still using the rayon I elongated the distance between the stitches,. 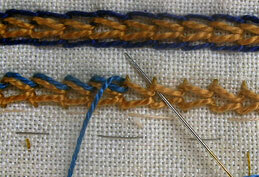 Then using a size 8 cotton pearl I worked alternate stitches wider to get a zig zag edge. 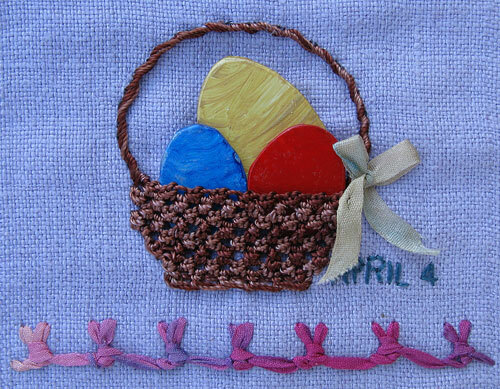 With a size 8 Rayon Pearl twist thread I not only alternated narrow and wide stitches but used a longer stitch at the edges of the wider stitches. I like this stitch but don’t much enjoy doing it because it is realy hard to keep an even tension on the loops so for the bottom row, still using the size 8 Rayon, added a bead to the thread before doing the left side loop and then went through the bead again to connect the diamonds, it was a little easier to work but it was still difficult to keep an even tension. 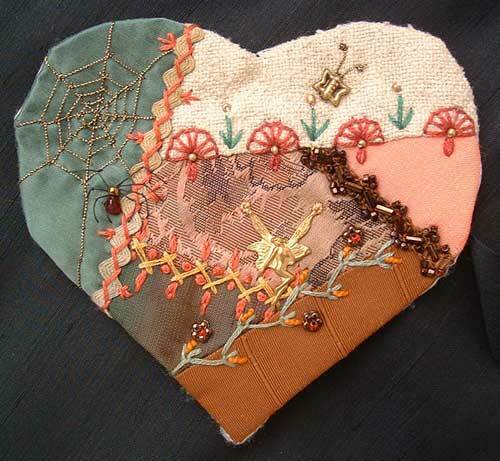 To use Diamond Stitch on a crazy quilt I have done a seam on my Box Top. It was meant to be Thorn Stitch (a variation of feather stitch) but as I got near to the end of the seam I looked at the instructions again and found that I had been doing something different…. And so to my sampler, the first thing to notice is the change of colour, I have decided to change the colour every month with the alternate months being different colours. but still it didn’t look like the picture, another look at the instructions from which band 3 was done. 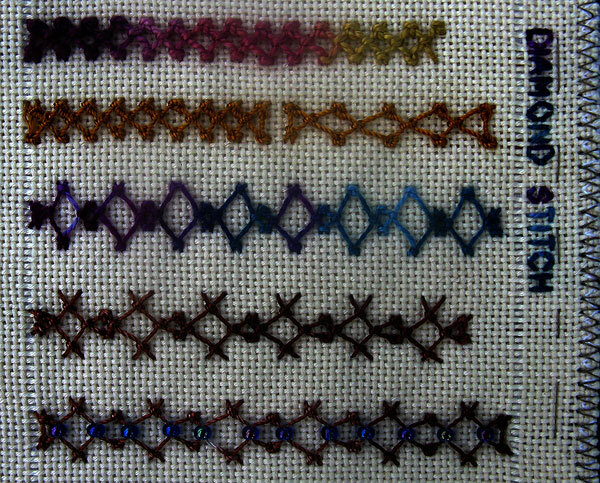 the instructions I was following where some I had printed at a very small size (to make them handy to carry in my sewing box), me thinks now that they were to small, after referring back to the full size intructions the 4th band is Thorn Stitch. 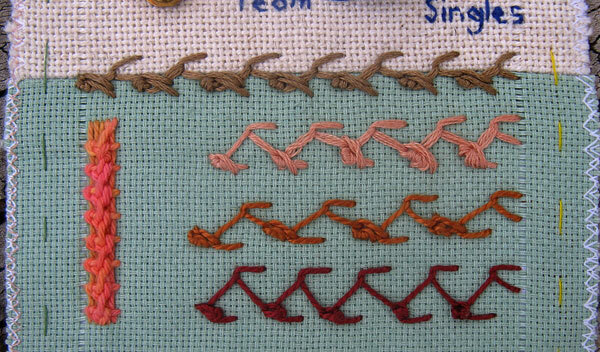 What did I learn from this stitch?…I learnt that miss reading instructions can be a good way to come up with different stitch variations. 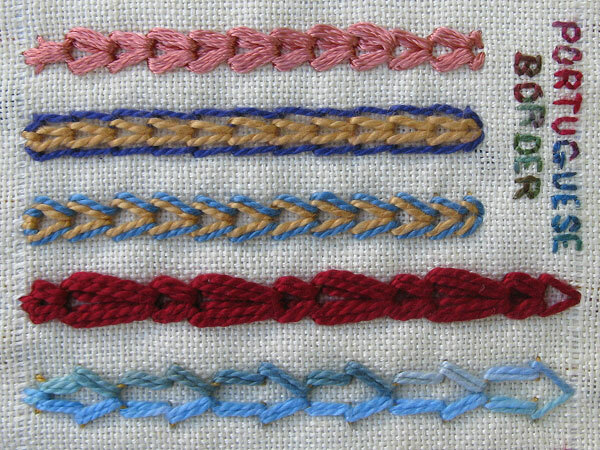 the short seam on the left is raised band feather stitch. Last night I said “At this stage the cream oval looks a bit wonky but lace will smooth out the top edge” and that is just what happened tonight when I stitched the lace on around the top of the cream oval. I added beads to the lace for a little sparkle. I cut the base fabric for my box top into 5 odd shaped pieces and tonight I have stitched the third join, I have photographed the back because it shows where the joins are more clearly than the front does. 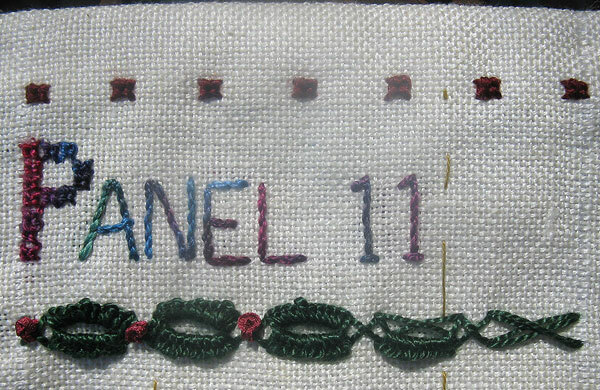 Last night I did a beaded detached chain stitch on my sampler, tonight I have done the same stitch on my box top.